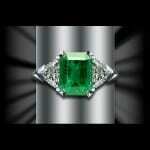 The emerald is the birthstone for May. At John Wallick Jewelers, in Sun City, Arizona, near Phoenix, AZ we carry beautiful, affordable emerald jewelry including emerald earrings for Mother’s Day. 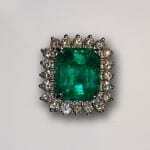 Emeralds are a variety of beryl exhibiting a particular shade of green. The top color is an intense medium-dark tone of slightly yellowish or bluish-green (sometimes referred to as grass green). Most of the emeralds are now mined in Brazil, but also come from Columbia and South Africa along with a few other countries. 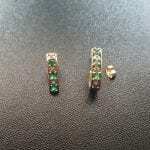 You can purchase Chatham emeralds at a much reduced price because they are the synthetic version. Chatham emeralds are durable and are very pleasing g to the eye. Note: Emeralds should not be heated and should be cleaned in lukewarm water only. Nero was said to have used emerald as a sunglass while viewing the chariot races. Emerald have also been said to have the ability to foretell future events. It was thought to strengthen the owner’s memory and quicken intelligence. 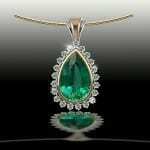 Some believed that wearing an emerald would make one more economical and therefore, most likely to become wealthy. Women considered the jewel a protection against ills, particularly those of childbirth. The step cut is the most popular and is also called the emerald cut. Famous emeralds and emerald jewelry include the Mogul (Moghul) Emerald – Dating back to 1695, this is one of largest emeralds ever recorded, the Crown of Andes, created around 1590 by settlers of the ancient city of Inca it contains 453 emerald gems set deeply in the frame and the Devonshire Emerald, named after the 6th Duke of Devonshire, its recorded value is 1,386 carats. If you are lucky enough to own a fine emerald, it will be one of your most prized pieces of jewelry! 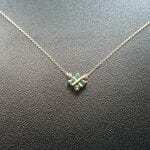 Visit us to and come see our display of emerald earring, rings, pendants and necklaces. It’s a perfect gift for a loved one born in May or for your mom on mother’s day.